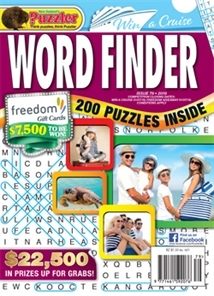 The magazine for you if wordsearches are your puzzle of choice: a variety of fun and interesting themes fill each issue. The other puzzles that you'll find include Sudoku, Pathfinder, Step Ladder and Add-a-Letter. We also have a wonderful big-prize competition that appears in every issue. In previous issues we've had cars, holidays and cash giveaways. So simply buy the most recent issue, follow the instructions on the coupon, and send it in for your chance to win.